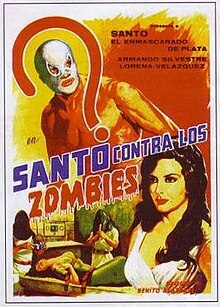 Santo contra los Zombies (also known as Santo vs. the Zombies) is a 1961 Mexican film directed by Benito Alazraki. It depicts the popular character El Santo in a pulp style film. After the police are unable to stop a crime wave by zombies, they turn to Santo for help. This was one of the earliest Santo films and the first to be distributed in the US. Writing in The Zombie Movie Encyclopedia, academic Peter Dendle said, "The adventure movie with its comic-book plot, hero, and villain is fun to watch in an MST-3K spirit". ^ Kay, Glenn (2008). Zombie Movies: The Ultimate Guide. Chicago Review Press. p. 40. ISBN 978-1-55652-770-8. ^ Dendle, Peter (2001). The Zombie Movie Encyclopedia. McFarland & Company. pp. 88–89. ISBN 978-0-7864-9288-6. This article related to a Mexican film of the 1960s is a stub. You can help Wikipedia by expanding it. This article about a science-fiction horror film is a stub. You can help Wikipedia by expanding it. This page was last edited on 29 March 2019, at 20:48 (UTC).